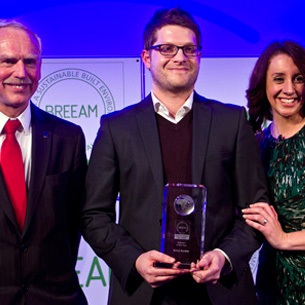 Director of GWP Project Services, Barry Rankin has become BREEAM Assessor of the Year at this years annual BREEAM Awards held last night at the ExCeL Centre in London. Barry who is a licensed and qualified Ecohomes, Code for Sustainable Homes and BREEAM Assessor, a BREEAM Accredited Professional (AP) and member of The Passivhaus Trust, received the award from BBC One Show presenter and Observer columnist Lucy Siegle along with Richard Hardy, Managing Director of BRE Global. To find our more information about GWP Project Services and the work they do follow this link.